In the readings for Sunday July 13th we have the parable of the sower (Matthew 13:1-23)that is so rich with meaning. In that parable,shared with people who knew about farming,there are two main elements the sower and the soil. Who is the sower? God is and those who speak God’s word to the earth and its people. Jesus the Christ is sowing God’s word in every parable and teaching and action. And all of us who share the word with one another by word and deed as Jesus did, are also sowers. And who or what is the soil? Beyond the metaphors of actual earth where seeds may fall, it falls in us. We are the soil and we are also part of an environment where the seeds fall. And this outside environment is a given in some ways, we did not create it and it surrounds us, but we can,as children of God, also choose it and change it with the freedom God has given us. The first reading from Isaiah 55:10-11 tells us that just as rain and snow water the earth making it fertile and fruitful and producing the seeds to be sown, God’s word goes forth and achieves the ends for which it is sent, including making us fertile and fruitful in building the kin-dom (world-wide all inclusive family of God) with God. The response in the Psalm(65) is beautiful: God has prepared the land and the grain, “softening it with showers and blessing its yield”. Even the “untilled meadows overflow with God’s bounty…They shout and sing for joy”. Below we share Rev. Beverly Bingle’s homily which focuses on the earth and the stewardship that is needed so it will indeed be able to sing for joy and not cry out in pain-so that it can be an environment for fertile growth.The second reading (Romans 8: 18-23)is in tune with Rev. Bev’s concern for our care for the earth as well: “We know that all creation is “groaning in labor pains…and we ourselves also groan within ourselves…” Paul is saying that all of creation should be freed from corruption (that which leads to death) and “would come to share in the glorious freedom of the children of God”. God wants full life for all of God’s creation, for the earth, the planet,and yes, the cosmos, and all living things including us, God’s beloved people. The sower sows the seeds everywhere, not only on the carefully prepared ground. And yet, when the ground is well prepared the seeds grow and bear fruit in phenomenal ways. I love that the seed is strewn everywhere. I grew up in the inner-city, in Brooklyn, New York, but we loved every bit of our little front yard and back yard and looked forward each Spring to every and anything that grew there. My Grandmother also had a flower box on the window sill. Whatever Grandma grew took hold no matter what the odds, including me. (Anyone who has read my book the House on Sunny Street(Americastarbooks.com)knows that there were many odds against me but nothing could hold back my faith and my growth that was watered with love, family,church and community strength). Grandma shared cuttings of her plants with all her friends and neighbors. Once a pot of tulips,a mother’s day gift, that were ready for planting in her box fell off the stoop and landed in the cellar below. Somehow it was not picked up and it was forgotten. We never entered the cellar from the outside. After a long winter, I was playing stick ball with my friends and the ball hit the side of my stoop and bounced down our long cellar stairs. I went down to get it and found beautiful tulips blooming in the thin caked dirt and debris. Grandma helped me carefully unearth them and finally planted them in her welcoming flower box where they were the talk of the neighborhood. From that moment on I learned that wonderful things can bloom even in the shallowest of earth. And, so like the sower I cast my seeds, my God given and inspired words everywhere, knowing they can bloom even when the ground is not prepared. But why would we as “the soil” that the word is to grow in choose not to be prepared when we can indeed help ourselves to become fruitful in building God’s kin-dom? How do we tend the roots to strengthen them? For some of us who receive the word with joy, “setbacks and persecution come” and we fall away (Matt 13: 21). We get it,sure, but we don’t want the hassle. Somehow we thought only good things would happen to us when we welcomed God’s kin-dom within us. We believed in a “gospel of prosperity” that Jesus never preached or lived. When life dealt its inevitable blows,when storms came, our fairy story religion did not hold-when it became hard to care for,when love had to exist with pain and struggle, we simply left the garden. Our people face violence and poverty and illness. They face illness without adequate health care,or, for some, any health care. It is hard to praise God, when you hurt badly in your own body and for your family members. Yet, every Sunday my heart is lifted by people who hurt and still love and spread the word, and live the caring and sharing of the Gospel. Yes, I know who is not there, but it is those who are there that lift my heart and keep me sharing the word. Some hurt and leave. Some hurt and grow and embrace others. How beautiful they bloom. What are those weeds and the thorns that choke out the new growth? What environments are not conducive to growth? We all get the message, but “anxieties and the lure of wealth choke off the message and it produces no fruit”(Matt 13:22). Jesus really did mean it when he told the “rich young ruler” to give away his goods to the poor and follow him. The early church shared its goods and none wanted for anything. That is hardly the church of today. Pope Francis is teaching and showing that simplicity and an even distribution of this worlds goods is necessary for Christ followers. There are many ways to do this. In the last few days people who followed Christ bought and gave entire home furnishings so that homeless women could start life again with new beds and household furnishings. We were also given a grant from The Father’s Table Foundation and ongoing donations from churches and individuals so this could happen and also so that our youth could see plays and visit educational and recreational settings-so they could avoid the streets and live. This sharing of money and goods directly with those who do not have is so beautiful. And yet as Pope Francis says it is the systemic nature of poverty(in America, Central America and everywhere) that must be challenged and changed. The church should have a major role in this change. And finally, the people we surround ourselves with can either help the seeds of the word to grow in us or they can choke it out. With my teens, so called friends that actually work hard to pull them down, are a major concern. The gangs and drug sellers compete actively for new recruits. Our kids have to be strong to walk away. For poor kids drug money is one way to leave poverty. And early pregnancy seems a road to a certain kind of status. It does not compute that jail and addictions and the responsibility for children may also follow. For many kids who do come from homes where there is plenty, church is not “fun” and not attended. Parents seem to give up and not even try to find a church environment where their kids could thrive and grow. I thank God for our parents who bring their kids instead of sending them,and who expect and encourage a God-connection from their kids. Our particular kids have been great in dodging the bullets. But it is not easy. In all of our lives there are those we listen to and look up to that pull us away from a life of service and compassion toward a life of taking care of number one. Maybe we can stop a moment and reflect: is my environment and my friendship group conducive to growing as a Christ follower? If not, maybe I can reach out and find a place to grow. Then my yield too can be a hundred fold- and the kin-dom of God will grow exponentially. 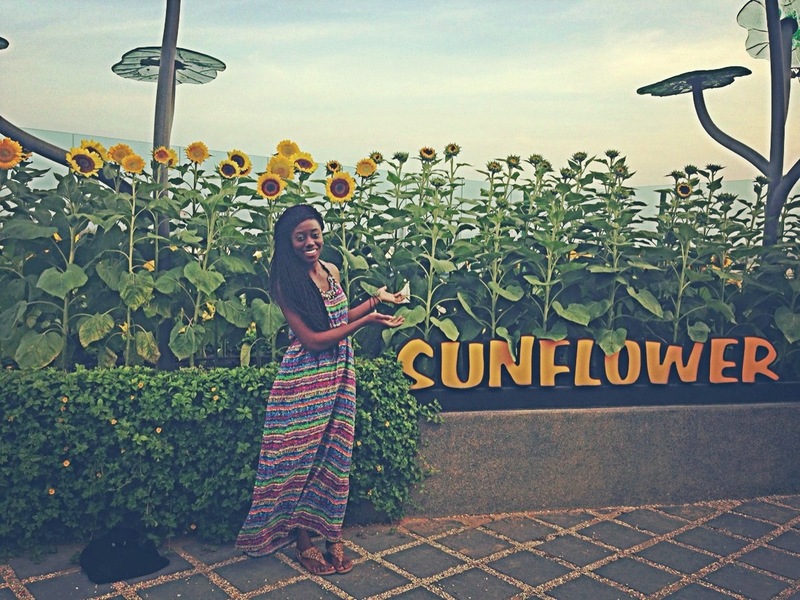 LIKE THESE FLOWERS AND OUR BEAUTIFUL YOUTH LEADER ,EFE JANE CUDJOE, LET US BLOOM AND GROW! they came with the second or third generation of Christians. is alien to Jesus but typical of gnostic influences of a later time. “One day, a farmer went out sowing seed. where birds came and ate it up. where there was little soil. it withered away for lack of roots. and the thorns grew up and choked it. thirty, sixty, even a hundred times what was sown. We ask who, in this parable, the sower is. and the shallow soil, and the thorns? in each of their communities at the time they wrote. What does this parable of the kin-dom tell us today? How are we to read it in light of the signs of our times? First, there’s a lesson in inclusion here. Suppose that, in the kin-dom of God metaphor, God is the sower. God sows the seed on all types of ground, without discrimination. Jesus’ message that the kin-dom is within us is for everyone. And there’s a lesson about God’s prodigal generosity. The seed is sown everywhere, not just in some places. Then there’s a lesson about preparation. the seed will not thrive. If it is prepared, the seed produces bountifully. And there’s a lesson about perseverance, too. even if it will choke the seed or let it be baked in the sun. Those applications of the parable are good. We can gain wisdom and guidance from their proverbial truth. given the signs of our times. growing environmental challenges to our home planet. environmental pollution, degradation, and destruction. and say it’s nothing new. forest fires, the extremes of heat and cold, the melting ice cap. where God’s word can take root and grow. destroyed by deforestation, drought, floods, agricultural runoff. and make mega-farming more profitable. where the people do not have the resources to protest. Our immoral way of life is killing the earth. But it’s not just corporate greed that’s doing it. then we mow it down and haul the clippings to a dump. produces as much pollution as four hours of driving a car. and end up causing the algae bloom that’s killing our lake. the municipal water supply of Plymouth, Michigan. end up in landfills or in the ocean; that’s 64.8 million a day. is a swirling mass of plastic trash. air conditioning, heat, light, cars, stuff. and all the grandchildren of the world. when they’re starving, sick, oppressed, naked, or wounded. the kin-dom of God will not take root among us. A cottonwood tree volunteered itself in my yard. I didn’t identify it right away—looked a lot like the pear nearby. and I thought to cut it down because it wasn’t part of my plan. along with the locust that sprouted this year. adding just a bit of cleaner air and cooler climate. and all those other footprints that contribute to climate change. to raise awareness of this environmental crisis. when it goes through Toledo September 24.
but it’s caused by the habits of individuals… like us. The Gospel requires it of us.